The old citizens of Anykščiai used to call this hill the sandhill and the sahara of Anykščiai, since it used to be grey, windswept and with no trees. This hill used to be often visited by the writer Antanas Žukauskas-Vienuolis, he used to come here alone or with his guests and enjoy the widely opened view of Anykščiai surroundings. Later he chose this place for the grave of Jonas Biliūnas. Jonas Biliūnas was born in 1879 in the village of Niūronys, not far from Anykščiai, and died in 1907 in the town of Zakopane, at the foot of Tatra Mountains (current Poland). In 1953 the remains of Jonas Biliūnas was brought back from Zakopane and reburied in Anykščiai on this hill. 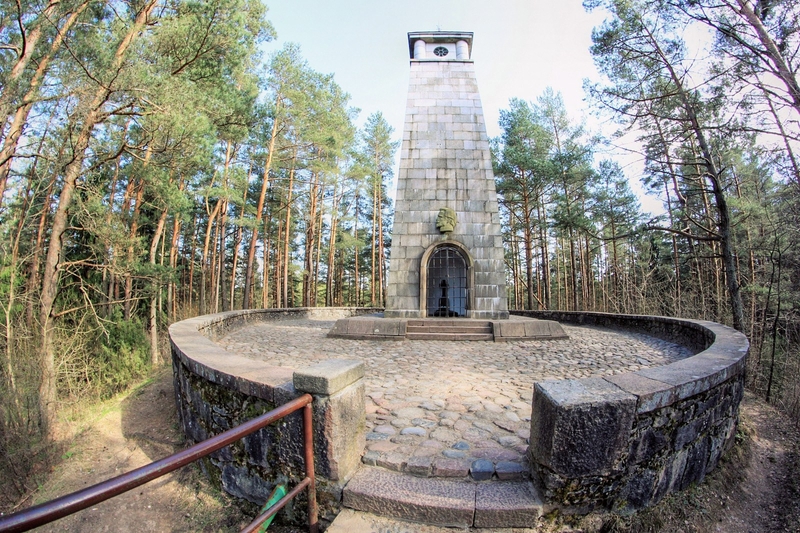 In 1958 a 14-metre monument was created and built from carved stones from the surroundings of Anykščiai by the architect Vytautas Gabriūnas. In the fairy tale The Light of Happiness the writer tells a story about a magic glowing inscription, which showed up on the top of a high and steep mountain, saying that the one, who should climb that mountain and touch the inscription with his hand, will make all people happy, but turn him into stone.